In researches of mechanical systems, vibration measuring transducer is the most popular tool. By type of sensing element, the vibration transducers are classified into piezoceramic, capacitive, inductive, and resistive. In measuring and test systems piezoceramic accelerometers are most widely used because they have larger dynamic range and more even AFR if compared to other types of sensors. The complex tests require connecting several dozens of sensors. Each sensor is periodically checked, and typically the same parameters are defined: conversion ratio, AFR flatness, AR non-linearity, relative transverse conversion coefficient, natural mechanical resonance frequency, etc. Repeatability of these parameters depends on methods and ways of conducting tests. Comparison methods, including comparison with application of mechanically connected accelerometers. The absolute method of accelerometer calibration based on application of laser motion sensor requires complicated professional equipment and is rarely used in practice. The absolute methods also include a method based on earth gravity force. When using this absolute method, the accelerometer to be calibrated is carefully turned in a vertical plane so that only earth gravity affects it. This method is only applicable in the low frequency area and used just for calibrating static accelerometers, such as VS 201 and VS 202. 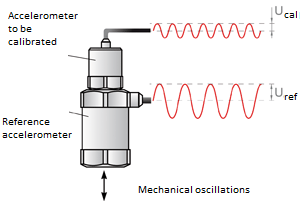 Methods with application of calibrators allow to determine sensitivity of accelerometers and require less equipment. To conduct measurements, besides a calibrator itself, only a recording device, e.g. vibrometer, is required. But since calibrators have rigid frequency and vibration amplitude, they are not suitable for determining some parameters of vibration sensor such as AFR flatness and AR nonlinearity. Unlike absolute methods and methods based on calibrators, the method of comparison with a sample is applicable for all types of accelerometers, enabling to determine all basic electrical parameters of sensors. A method of determining parameters of vibration transducers by comparison with a reference sensor is based on relative measurements. To ensure precision and convergence of results obtained during the tests by comparison with a reference sensor, it is necessary to follow MI 1873 guidelines.